Recap: Nvidia is bring AI to the masses with its new Jetson Nano Development Kit. The Jetson Nano, which packs a serious punch for such a small device, will rival the Raspberry Pi in the mini-computer space. The Nano uses Nvidia's JetPack AI SDK, enabling users to test and experiment with new AI. Nvidia touts that the device will support most any AI platform currently available. Nvidia on day one of the GPU Technology Conference announced the Jetson Nano, an AI computer that enables users to create millions of different intelligent systems. The Jetson Nano is the latest in the Jetson line of devices utilizing Nvidia's Jetpack AI SDK. The device, which is a bit larger than a Raspberry Pi, brings impressive specifications. Delivering 472 GFLOPS of compute performance, the little machine is capable of running modern AI workloads. The Jetson Nano packs 4 GB of DDR4 RAM (versus the Pi 3's 1GB of DDR2), a quad-core ARM A57 running at 1.43 GHz, a 128-CUDA core Nvidia Maxwell GPU, and inputs for DisplayPort, HDMI, and even M.2. All of those specs are delivered in just a 5W power envelope. Just like the Pi, the OS is run off of an external microSD card. The unit is powered by a micro-USB cable, but there is also a barrel connector allowing for more powerful PSUs for heavier workloads. One significant drawback of the Jetson Nano is the lack of Wi-Fi and Bluetooth connectivity. You're limited to Ethernet or the use of a Wi-Fi dongle. Adding a Wi-Fi dongle won't likely be as easy as plug-and-play, as drivers for many of the compatible operating systems can be hard to come by. The GPU and CPU are contained on an add-in board that should theoretically be able to be swapped out for more powerful hardware in the future. This modular design is unique and hints at Nvidia releasing different hardware variants of the Jetson Nano. The CPU and GPU come with a heatsink mounted on top, with mounting holes for an optional fan. The powerful GPU allows for not only AI workloads, but for HEVC video encoding and decoding, meaning the device can handle multiple video inputs at once. Nvidia is counting on a communal effort to bring projects and source code to the Nano platform, with one of the earliest projects being available, called JetBot AI, consists of 3D printing wheels for the Jetson and having it run collision-avoidance algorithms. 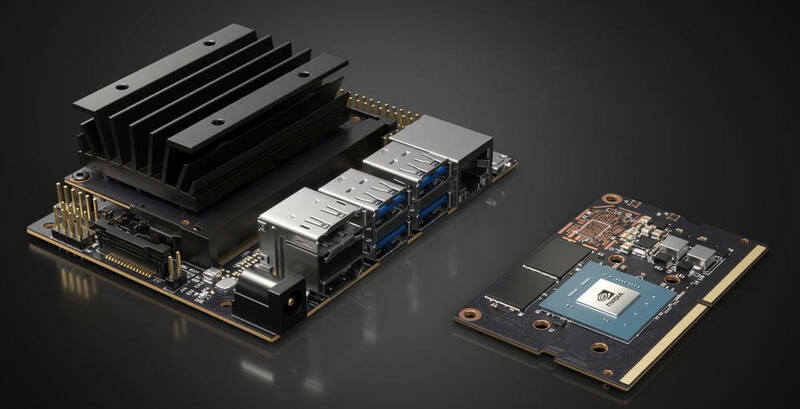 Nvidia claims that the Jetson Nano is capable of running almost all modern AI, including OpenPose and Tiny Yolo. The Jetson Nano Development Kit is available to pre-order from Nvidia for $99, and should start appearing on store shelves later this month.